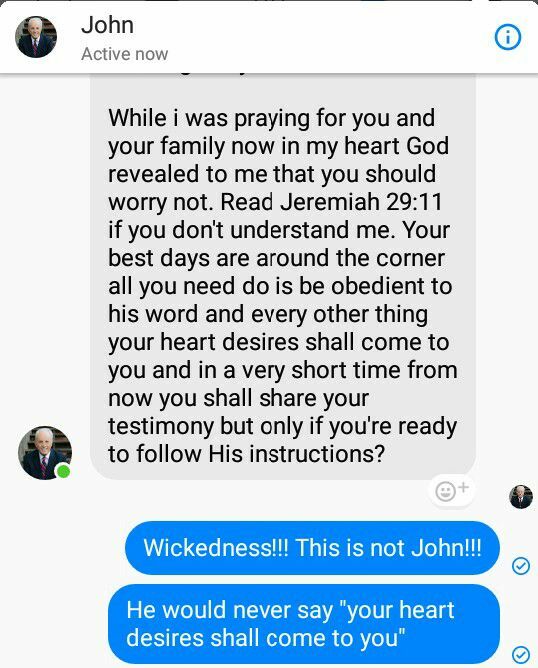 Facebook users were surprised to see John MacArthur reach out to them in a personal message. They were even more surprised that what he had to say was something like what Joel Osteen would say. We reached out to one of the discerning Facebook users who was thinking: “Wait a minute.” You can tell that the user wasn’t having it. Good call, discerning Christians. That’s not JMac. He then laid the JSmack down (we just invented a new term) on the imposter. Oddly enough, the November 18 post on the fake JMac’s page called the fake prosperity Gospel “damnable heresy.” But then, in a wicked underhanded way, the person sends prosperity promises through Facebook messenger. You can see the fake page here. If you all will mess with them enough (and we know you will), we might have the page shut down by lunchtime. Besides, everybody should know that Dr. MacArthur only uses Pinterest. Next story Is Discernment Biblical? These 14 Minutes May Change Your View.